On the ground. 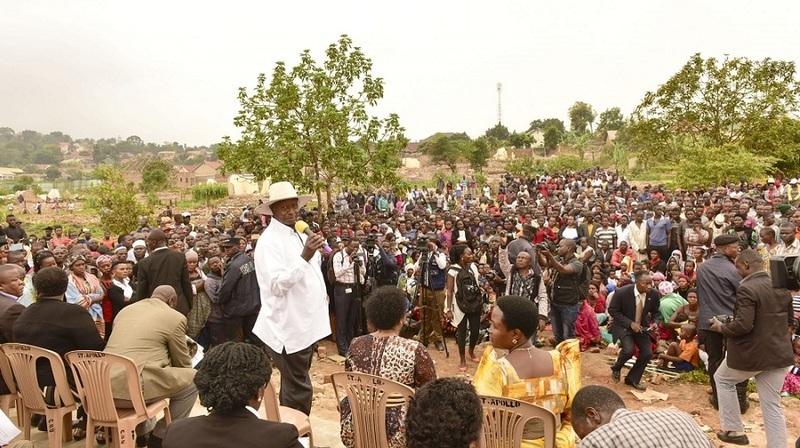 President Museveni addresses residents of Sekanyonyi-Lusanja in Kasangati Town Council, Wakiso District, yesterday. 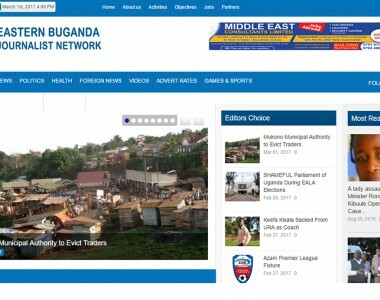 Wakiso. Emotions ran high yesterday as President Museveni toured a 75-acre land where hundreds of families were violently evicted and property worth millions of Shillings destroyed in Sekanyonyi-Lusanja Village, Kasangati Town Council, in Wakiso District. Angry residents reported to the President that last week, businessman Medard Kiconco, who claims to own the land, with the help of armed policemen and gangs, violently evicted them from the land where they have lived for decades and destroyed their household property. Hundreds of people struggled to show the President the injuries they sustained during the Friday morning incident and cried for help to be allowed to repossess their land. The residents led by Mr Fred Kanyike, said a total of 350 homes were demolished by armed men during the violent exercise before their land was fenced off. They added that 250 other homesteads also face the same fate. Mr Kanyike told the President that the armed men, housed in a nearby warehouse, were commanded by police from Kasangati Police Station. Mr Joseph Kawooya, another resident, told the President that the eviction exercise followed a meeting convened by officials purporting to come from Operation Wealth Creation headed by President’s young brother, Gen Salim Saleh. “We have been troubled, tortured because of corrupt government officials, including the police and local council leaders,” Mr Kawooya said. The President, flanked by the land probe team led by Justice Catherine Bamugemereire and ministers Rosemary Seninde (State for Education) and Persis Namuganza (State for Lands) halted any further eviction and demolitions. He said government, through its agencies, would investigate the matter to bring the culprits to book. “No one should carry out any further demolition and those behind it will be prosecuted,” Mr Museveni said, adding that the property lost in destruction will be compensated by government. “I hereby direct the Office of the Prime Minister to buy tents for the victims of this eviction to stay in, buy them food as government works out compensation for the loss of property as we look out for those behind the demolition,” the President said. Justice Bamugemereire said the eviction was executed amid ongoing investigations and in defiance of temporary orders issued by the land probe committee stopping any activities on the disputed land. “We stopped any action on this land but the holders went ahead and lied to the police. 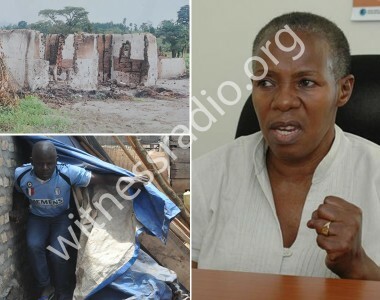 We got surprised that Kiconco hoodwinked the police to destroy peoples’ property without notice,” Ms Bamugemereire said. She appealed to the President to engage the Chief Justice to issue new directions stopping magistrates and registrars from issuing eviction warrants. Accusations. Meanwhile, the land inquiry will today hear evidence into a complaint in which the head teacher of Mengo Senior School is accused of grabbing a prime piece of land in Nakulabye, Rubaga Division in Kampala. 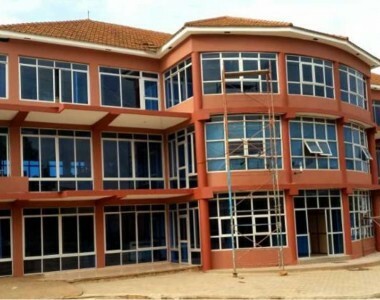 It is alleged that the school head, Mr John Fred Kazibwe, is fronting associations purporting to be under the foundation of Mengo Senior School to grab the land measuring 1.013 acres on Block 10 plot 50 in Senkatuuka Zone, Balintuma Road. Sitting at the National Records and Archives Centre in Kampala, the Commission is inquiring into the law, processes and procedures in land acquisition, land administration, and management in the country. 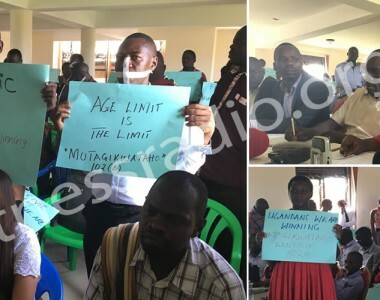 CIVIC Space Onslaught: Have Ugandan NGOs grown to be feared and discriminated by a 31 year old regime in power?